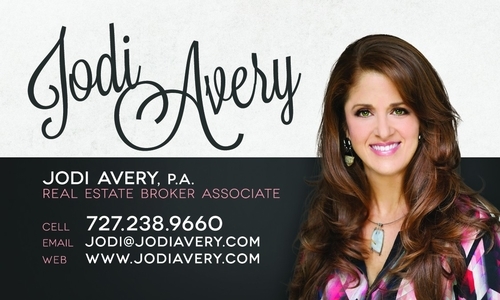 Passionate about helping others, Jodi Avery prides herself on getting the most money for your property, in the least amount of time, with as little stress as possible. Working hard in Pinellas County and surrounding areas, Jodi represents residential buyers and sellers in Clearwater, Safety Harbor, Oldsmar, Dunedin, Palm Harbor, Tarpon Springs, New Port Richey, and Trinity. Jodi aims for her clients to be confident and have a peace that a “friend” is working for them, ensuring that every step of the process goes as smoothly as possible. Practicing realty since 1993, she is an actively licensed Florida Broker Associate with Keller Williams, now the largest franchise real estate company in the United States. Jodi specializes in residential properties including single-family homes, luxury properties, condos, and income producing properties. As a seasoned and trained negotiator, Jodi is dedicated to getting clients the best purchase price and the most money for your property, while arming herself with integrity, honesty, and sincerity. Jodi resides in the Safety Harbor area and is a member of Working Women of Tampa Bay, For the Girls International, and Calvary Baptist Church. Jodi is an accomplished tennis player and enjoys rollerblading along Bayshore Blvd., playing shuffleboard in St. Pete, and bike rides to the beach with her kids.